I agree with Grahamh8, the ignorant aussie barman gave me a pint at least 10% short and said it was a legal requirement, he did top it up to my satisfaction but was very arrogant and unprofessional, furthermore the next customer was given a glass of beer with something black floating in it, instead of disposing of the pint he scooped the offending item out with a knife and handed the beer over. If I had been from trading standards he would have ended up at best sacked or in court. This place is a dump and best avoided. From the outside the Red Lion is a fine looking building situated on the corner of Gloucester Street and George Street in OX1. It's had various previous guises including a stint as part of the �Firkin� chain and then a stint as one of the truly awful 'Goose' brand of hostelries. Having undergone a major refurbishment in early 2011 this is now one of those places that is advertised as �Pub and dining� which basically gives you a big enough of a clue that this is now a gastro pub more aligned to being a restaurant with an interior remodelled and designed by those that think a place is made more attractive by putting lumps of dead wood and vases full of dead twigs around the place. One gushing foodie writer penned the following in a local Oxford rag just after it opened in its current guise. 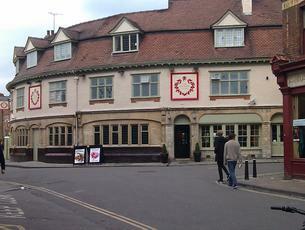 �The Red Lion is a typical pub by name, but by no means a typical pub by nature. Hoping for pork-scratchings, beer-mat pyramids and belching contests? Then you're better off heading to your local Wetherspoon's. This is an establishment that adheres to the new-era laws of The Gastropub - 'cosy cappuccino' paint, contemporary art and oh-so-trendy driftwood sculptures.�, which just about tells you all you need to know, which is probably to steer clear if you�re just after a pint..
Well almost. There is a very decent outside drinking area at the back of the pub and on a fine day it�s a good spot to escape the foodie interior and worth investing in a pint to sup on the outside terrace. As mentioned very much a modern gastro pub in a fine external building skin, but there are three handpumps dispensing two Brakespears beers and a decent pint of Everards Sunchaser. This place isn't really a gastropub, more a 'nouveau riche' gastropub for townies doing Loadesmoney impressions. Sure, the food looked good and the cocktails were tasty but the service is supercilious and the atmosphere seemingly recreated by a denizen of that most suspect of 90s phenomena - the DJ bar. It's had various guises including a stint as part of the not wholly awful 'Firkin' chain and the in no way acceptable 'Goose' brand of hostelries. The garden is big and a blissful refuge from the interior - if only one were able to use it for more than one night a year. 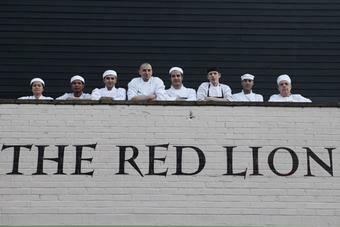 The Red Lion has undergone a major refurbishment , pub looks great , servers are friendly and food is fantastic. Prices are competitive for a city centre gastro pub and their products are about quality. Outside we dined and had full waiter service in the non smoking dining area overall great this is what Oxford has been looking for! Sorry can't agree with the previous review. 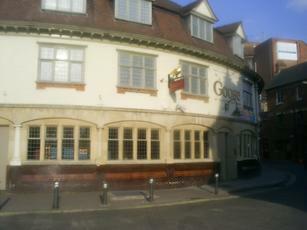 This is now a gastropub, gone has the great pub atmosphere that this place generated in the past. On the plus side the refurbishment looks good but that's where the good points end. The food prices have doubled or in some cases trebled from previous prices without the same incremental rise in value. The pub has a great outside seating area, patrons not eating are herded to one side and not allowed to sit at the majority of tables which are for those dining despite most of these being unoccupied during our stay. We were served short measure pints and the bar staff refused to top up and were rude in the process!! They have been instructed to serve a 5% head inclusive of the pint measure, legally I believe this allowable, but where was the good will, we have never been refused a top up before. We will not be returning to the pub until it changes hands again, which has happened frequently over the years. There are many great pubs in Oxford, try these in preference to the Red Lion.